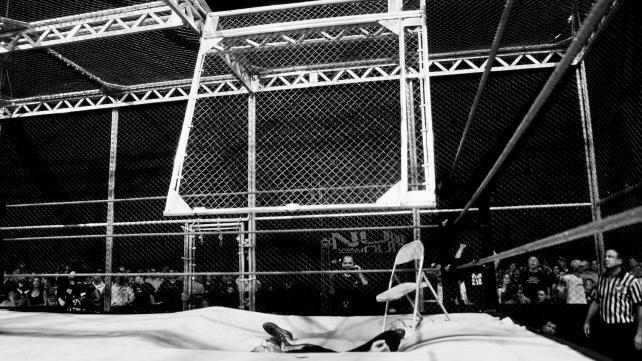 The Pro-Wres Digest for June 19th – 25th – Reigns Suspended, Paige Not Arrested, Punk UFC Fight, CWC, New Japan & Much More! What a sensational top story we have for you this week, as on 21/6 WWE officially suspended Joe Anoa’i for 30 days for violating the Wellness policy. The story was picked up by mainstream news outlets like ESPN, the BBC and Rolling Stone and Reigns quickly issued an apology via Twitter. He owned up to a “mistake” he made, which he was no doubt instructed to by one of the suits in the PR department who must have had one hell of a day on Tuesday. Reigns dropping the title clean to Rollins at Money in the Bank makes a lot more sense in hindsight, but the interesting part of the story is that it appears the WWE were aware of Reigns failing the test before Money in the Bank, according to Dave Meltzer in the Observer. That would mean they made the decision to still go with the Shield three-way for BattleGround even though Reigns would be off TV for 30 days. Reigns last TV appearance was this past Monday on 20/6 when he wrestled Seth Rollins in a #1 contenders match which ended in a double count out to set up the Shield three-way at BattleGround. WWE could have easily changed the plan and put Rollins over and done a singles match with Ambrose at the PPV instead, however they brazenly stuck with the three-way despite everything that was going on with Reigns. WWE were quoted by F4Wonline, saying, “The suspension runs through July 20. He is eligible to return on July 21. Battleground is on July 24. We are considering all of our creative options.” On SmackDown this week they talked about the three-way as if Reigns would still be in the match, so it appears that “considering all of our creative options” means act like nothing ever happened. I can only imagine the kind of visceral hate that will be directed towards Reigns when he comes back after a highly publicized drugs failure and is slotted right back in as the top babyface. 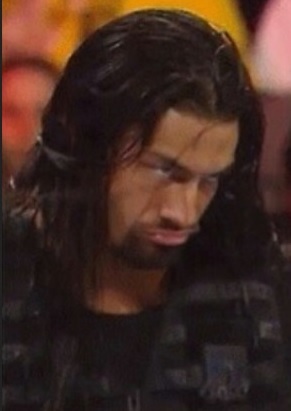 What is curious however, is that Reigns is the first high profile Wellness failure in a long time. There had been a handful of low-level talent failures, such as Hornswoggle, Ricardo Rodriguez, Konor, but not since Randy Orton received his second violation in 2012 and was suspended for 60 days had anyone of any significance been popped for anything. I don’t personally believe that the WWE are actively covering up positive tests of their top stars and the fact that they wasted no time in suspending Reigns should put that myth to bed. On the other hand, you have to be extremely naive to think that the rest of the WWE locker room is completely clean, especially the top guys. There was a bizarre situation following the Money in the Bank show in Las Vegas on 19/6, involving Paige & Alberto Del Rio. Rumours started flying around late on 19/6 when a picture of what appeared to be Paige being placed into the back of a police wagon surfaced online. Pro Wrestling Sheet reported that the Las Vegas police officers were outside of Caesar’s Palace for an unrelated incident when they alerted to a, “female running into the streets.” When the police caught up to the woman, who turned out to be Paige, they determined that she needed to be detained and taken to hospital for undisclosed reasons. It would seem that WWE were not too concerned however, as they had Paige wrestle on RAW the very next night, which is certainly not common practice for a performer detained by the police and taken to hospital. Court Bauer revealed on MLW Radio Alberto Del Rio’s side of the story and here’s what apparently went down: Del Rio & Paige went to a post-MITB show in Vegas and were being harassed by a drunken couple of hecklers. Del Rio called over security and the couple were ejected from the venue, however they waited outside for Paige & Del Rio to appear. When Paige & Del Rio did leave the club, there was a confrontation with the drunk couple, which led to Paige running into the street and the police being altered. Paige was handcuffed and taken to hospital for an evaluation – maybe the Las Vegas cops heard her English accent and thought she was completely out of her mind. She was given the all-clear at the hospital, released and had no charges were filed against her, which is probably why WWE didn’t pull her from the RAW show on Monday. Here’s a video of Paige seemingly being detained by the police. 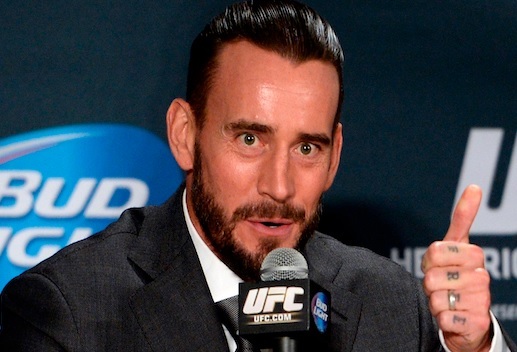 Eighteen months after signing for the UFC, CM Punk’s long-awaited MMA debut was actually made official on 22/6, when Punk announced on UFC Unfiltered podcast that he would be fighting Mickey Gall at UFC 203 on September 10th in Cleveland, OH. Punk’s debut was first postponed in October 2015 due to a shoulder injury suffered in training. On February 6th this year, Mickey Gall choked out Mike Jackson in just 45 seconds on the UFC Fight Night card and earned himself the right to be Punk’s first opponent in a fight many expected to take place at UFC 200. Punk ended up pulling out due to a herniated disc in his back which required surgery and he went under the knife on February 10th in his home of Chicago. Punk noted many times that both injuries were lingering issues from his pro wrestling days and now that he appears to be all healed up, as much as a 37 year-old ex-pro wrestler can heal, it will be interesting to see if he can actually make it through an entire training camp this time. In a strange coincidence, UFC 203 will take place at the Quicken Loans Arena in Cleveland, OH – the very same arena that Punk told Vince McMahon he was going home and walked out on the WWE RAW show on January 27th 2014. When the news of Brock Lesnar returning to the UFC for a one shot deal broke two weeks ago, one of the major questions many people had was, what will the WWE get in return? Fox Sports reported on 6/6 that the WWE were interested in bringing in Paige VanZant to be a part of SummerSlam in some capacity. VanZant appeared on ESPN SportsCenter on 23/6 and suggested that she would not be at SummerSlam, as she is fighting six days later on August 27th against Bec Rawlings in Vancouver, BC. VanZant said she loved the WWE and was a big fan, but claimed she is focusing on training for her fight. This could all be a game to try and keep any potential deal quite, although with SummerSlam being on August 21st and VanZant booked to fight on the 27th, it looks extremely improbable that she would make an appearance for WWE before her fight. With the brand split announced for July 19th in Worcester, MA on SmackDown, the WWE have apparently been contacting some big names in hopes of bringing in some much needed star power to bolster the separate rosters. Forbes reported on 18/6 that “sources” had told them the WWE were interested in names such as, Goldberg, Rey Mysterio, Jeff Hardy & Kurt Angle. Hardy has openly talked about wanting to end his career in WWE and Mysterio will always going to be a useful asset to the WWE. Goldberg could conceivably be given a Legends deal and maybe do the Hall of Fame, but I have to imagine the chances of him coming into work matches in extremely slim. Then there is Kurt Angle, whom we heard countless times over the last ten years was persona non grata when it came to the WWE. The story was always the same when it came to talk of Angle potentially returning to the WWE: Vince McMahon does not want the stigma of having an Olympic gold medalist dying in his ring, on his watch. Angle appeared on Mark Madden’s 105.9 The X radio show on 20/6 and confirmed that he had meetings with both Vince McMahon & Triple H in the last six weeks. “Will I return? Yes,” Angle said.”I don’t know when,” he added. Angle went on to mention that he would like to be brought in with a part-time role and said he was interested in managing Jason Jordan & Chad Gable. 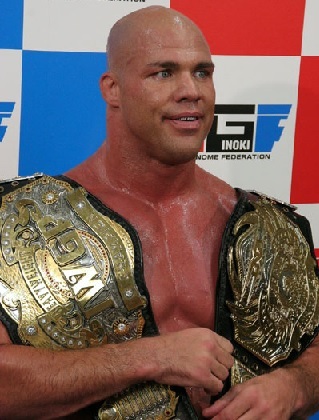 The rumours of Angle making a return were quickly squashed on 23/6 when WWE officials confirmed with F4Wonline that Angle was in fact not returning to the company, so it looks like Kurt will have to get by on the $25,000 he charges to work a sub-ten minute match on the indies. Kota Ibushi, Tajiri, Mascara Dorada, Zack Sabre Jr, Noam Dar, Da Mack, Mustafa Ali, Clement Petiot, Harv Sihra, Gurv Sihra, Fabian Aichner, Brian Kendrick, Rich Swann, Cedric Alexander, Akira Tozawa, Jack Gallagher, Tony Nese, Johnny Gargano, Tommaso Ciampa, Ho Ho Lun, TJ Perkins, Drew Gulak, Anthony Bennett, Tyson Dux, Lince Dorado, Sean Maluta, Raul Mendoza, Kenneth Johnson, Alejandro Saez, Damien Slater, Ariya Daivari & Jason Lee. The first round of the CWC was taped on 23/6 at Full Sail and there was a special opening ceremony type deal streamed live on Facebook before the show got underway. It looks like four episodes were put in the can and we’ve got the full list of results at the end of the Digest. Moose and Roderick Strong are to be not long for ROH, as both men have not re-signed a new deal and their current contracts are set to expire imminently. Dave Meltzer reported in the Observer that Moose’s deal expired on 19/6 and he is in the process of finishing up his commitments to ROH. Meltzer noted that Moose is expected to undergo the requisite medicals and if he passes will be offered a WWE developmental deal to be brought in to the Performance Centre in September. ROH actually announced Strong’s departure on 22/6 and said he was leaving to pursue “other opportunities.” In some better news for ROH, Katsuyori Shibata will make his debut for the company on 19/8 at the Death Before Dishonor PPV in Las Vegas. * Kamaitachi vs. Kyle O’Reilly. * Silas Young vs. ACH. * Roderick Strong vs. Mark Briscoe. 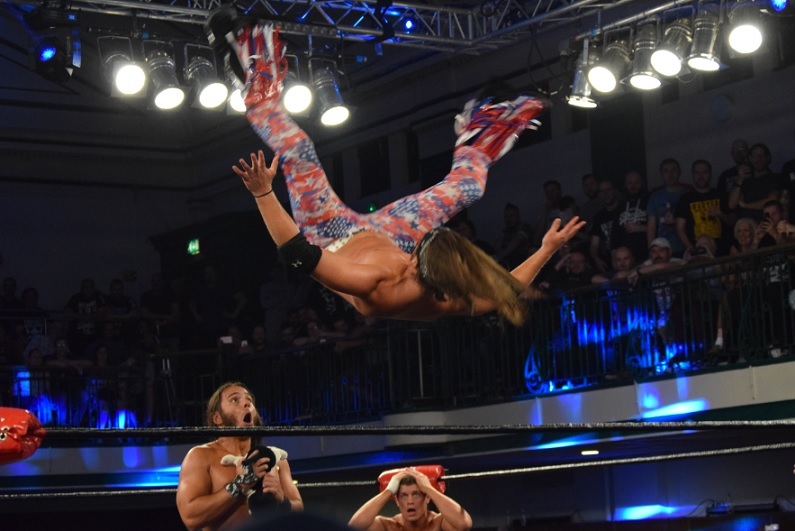 * Tornado Match: War Machine & Moose vs. Adam Cole &the Young Bucks. * Street Fight: Steve Corino vs. B.J. Whitmer. * ROH TV Championship: Bobby Fish (C) vs. Dalton Castle. * ROH World Championship: Jay Lethal (C) vs. Jay Briscoe. PWG’s next show is on 29/7 in Reseda, CA and the main event of the as yet unnamed show sees Zack Sabre Jr making the first defence of the PWG World title against Kyle O’Reilly. Chris Hero & JT Dunn will challenge the Young Bucks for the Tag Team titles and Roderick Strong will face Timothy Thatcher. Also booked for the show, Tommy End vs. Adam Cole, Sami Callihan vs. Marty Scurll, Jeff Cobb vs. Trevor Lee and Chuck Taylor vs. Trent Baretta. New Japan drew a reported 9,925 fans to Osaka-Jo Hall for Dominion on 19/6 to see Kazuchika Okada regain the IWGP Heavyweight Championship for a fourth time from Tetsuya Naito in an excellent match that went 28:58 (**** ¼). The show went over four and a half hours with no intermission, however I found that the show didn’t really drag much at all, which is much more to be said than the WWE Money in the Bank PPV. Dominion had some great matches, with a couple of questionable booking decisions, such as Naito failing on only his second title defence and dropping the title back to Okada. Naito had a lot of steam as the top heel and Los Ingobernables de Japon over took the Bullet Club as the major “cool” heel faction in the company in recent months. Jado & Gedo obviously have a plan for the G1 and Wrestle Kingdom on 4/1 next year, however I would have expected Naito to have remained the champion at least until the big King of Pro Wrestling show in October. After Okada beat Naito, with three Rainmakers like he did to Tanahashi this year at the Dome, he declared that his goal was to win the G1 as the IWGP champion. This seems highly unlikely as the winner of the G1 gets the briefcase for a title shot at Wrestle Kingdom, so maybe the plan is for Naito to win the G1 again and actually get the chance to main event the Tokyo Dome which was taken away from him in 2013. Still, every year there is talk of Katsuyori Shibata winning the G1 and this year would seem as good a time as any for Shibata to finally pull it off. That is probably just wishful thinking on my part, because after Shibata regained the NEVER Openweight title from Yuji Nagata in a hell of a match at 14:53 (**** ¼), he challenged Tomoaki Honma during his post-match press conference. There were five title changes in all on the show. Semi main event saw Michael Elgin capture the IWGP IC Championship from Kenny Omega in an epic 33:32 minute ladder match. Match was full of high spots and interference; finish saw Elgin Powerbomb Omega off a ladder on the floor onto two evil Japanese tables that didn’t break and he climbed up to retrieve the belt (**** ½). Mark & Jay Briscoe downed the Guerillas of Destiny (Tama Tonga & Tana Roa) to win the IWGP Tag Team titles in 14:02; it was one of the weakest matches on the show (** ½). Kushida retained the IWGP Jr Heavyweight title over Will Ospreay with the Hoverboard Lock in an excellent match in 14:36 (****). The Young Bucks took back the hot potato IWGP Jr Tag titles in the elimination four-way; RPG Vice & reDRagon were eliminated via the over the top rope rule and the Bucks pinned Sydal with the Meltzer Driver (***). Hirooki Goto downed Evil in another good match with the GTR in 9:53; Goto & Evil have developed really good chemistry together (*** ¼). Tomohiro Ishii & Yoshi-Hashi beat Sanada & Bushi in 7:05 when Yoshi-Hashi submitted Sanada with the WAR Special ay 7:51; it looks like Yoshi-Hashi could actually end up in the G1 (***). Adam Paige, Bad Luck Fale & Yujiro Takahashi beat Togi Makabe, Yoshitatsu & Captain New Japan in a nothing 7:05 match when Paige pinned CNJ with the Omori Driver (**). Opener was the Jay White send-off match and White, David Finlay & Juice Robinson lost to Manabu Nakanishi, Satoshi Kojima & Hiroyoshi Tenzan in 7:53 when Tenzan submitted White with the Anaconda Vice. White did a promo in Japanese afterwards; he thanked all the fans for their support over the last two years and said he hoped to return to NJPW in a few years stronger than ever. Throughout the show, they showed MMA fighter Shinya Aoki at ringside with Takaaki Kidani. Aoki didn’t do anything newsworthy, although Kidani gave Naito a fist-bump when he came out for the main event. New Japan’s next tour are the Kizuna Road shows which run from 24/6 to 3/7. The 27/6 show at Korakuen Hall will feature the announcement of the blocks for this year’s G1, as well as two Chaos vs. LIJ main events of Goto & Yoshi-Hashi vs. Sanada & Evil, and Okada & Ospreay vs. Naito & Bushi. The 3/7 show is in Iwate and has two title matches and a big Chaos/LIJ eight-man elimination match. The Elite (Omega & the Bucks) defend the NEVER Trios titles against Kojima, Ricochet & Matt Sydal, Okada, Goto, Yoshi-Hashi & Ospreay vs. Naito, Evil, Sanada & Bushi is the eight-man. Main event of 3/7 see’s Tomoaki Honma challenging Shibata for the Never Openweight title. FMW ran Korakuen Hall on 21/6 for their big FMW vs. UWF show which featured four no rope barbwire matches. Main event saw the FMW & W*ING Monster Alliance (Atsushi Onita, Raijin Yaguchi, Nosawa Rongai & Hideki Hosaka) beat the UWF Alliance (Masakatsu Funaki, Yoshihiro Takayama, Mitsuya Nagai & Takuma Sano) in a No Rope Barbwire 8 Man Tag Death Match when Onita submitted Sano with a Chicken Wing in 14:48. Afterwards, Onita challenged one of the UWF guys to an Electric Current Blast Death Match and mainly directed his challenge to Funaki & Takayama. Second from the top was Team FMW (Masato Tanaka & Buffalo) over Team UWF (Tatsuo Nakano & Alexander Otsuka) in a No Rope Barbwire Tag Death Match in 7:26. The UWF did get a win on the undercard, as the UWF Alliance (Yoshiaki Fujiwara, Takaku Fuke & Daisuke Ikeda) beat the FMW & W*ING Monster Alliance (Katsuji Ueda, Tomohiko Hashimoto & Kazuhiko Matsuzaki) in a No Ropes Barbwire 8 Man Tag Death Match in 7:03 when Fujiwara Arm-barred Matsuzaki. There was also a women’s Barbwire match and Miss Mongol downed Dump Matsumoto in 6:12 with a Small Package. Kaji Tomato qualified for the Super J-Cup when he beat Ayato Yoshida in the final of K-Dojo’s one night tournament on 19/6 in Chiba. Tomato suffered a fracture to his right heel and will miss all of the K-Dojo shows for the next month, although he hopes to be back in time for the J-Cup. The long running saga with Ricochet’s Lucha Underground contract seems to approaching the zero hour. Ricochet is still under his original 2014 deal which is set to expire this weekend and he has not yet signed a new contract to stay with Lucha Underground. MSL noted on MLW Radio that Ricochet has been offered $300,000 a year, which would in fact be paid for by the El Rey Network and not Lucha Underground, and would still be able to work New Japan & PWG under the terms of the proposed new deal. This weekend is also the final tapings for season three and the booking team has somewhat backed themselves, and Ricochet, into a corner, as the main event of Ultima Lucha III sees Prince Puma challenging Johnny Mundo for the LU title with the stip that Puma must retire if he loses. Presumably the finish of the match will depend on whether Ricochet signs the new deal. Dave Meltzer commented in the Observer that WWE “want him bad” although he would not make anywhere near the money that the new LU contract would guarantee him. Meltzer also noted that under the terms of his original deal, if he doesn’t re-sign Ricochet would only be allowed to go to the WWE six months after season three airs on TV, which would be the end of 2017 or early 2018. 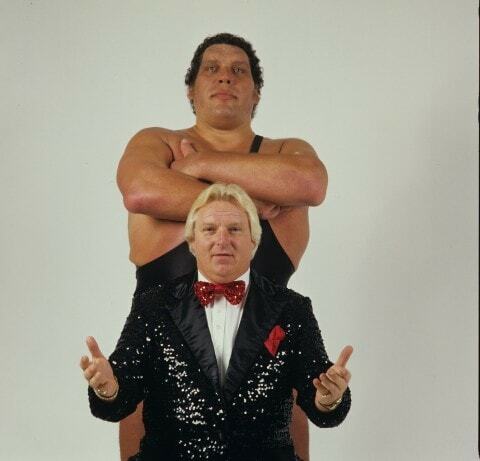 Obviously, that would not stand-up in court so if WWE want him bad enough they will surely get him. New Japan officially announced that IWGP IC Champion Michael Elgin and IWGP Jr Heavyweight Champion Kushida are heading to Mexico to work some shows for CMLL and will miss the Kizuna Road tour as a result. Elgin will be brought in from 22/6 to 12/7 and Kushida 23/6 to 16/7, which means they will be sticking around after the Gran Prix iPPV on 1/7. 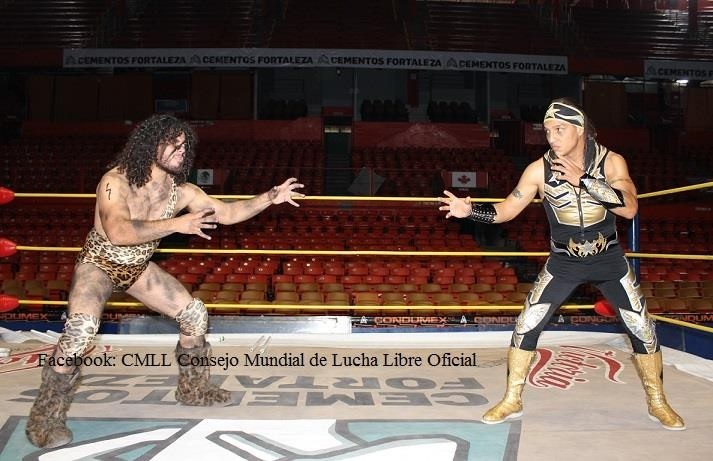 CMLL booked Barbaro Cavernario and Rey Cometa in a hair vs. hair match for the big Gran Prix iPPV on 1/7 from Arena Mexico. There was a note in the Observer about current ICW World Heavyweight Champion and one of the top names on the UK scene Big Damo being a contender to be brought in as part of WWE’s September recruiting class. Candice LeRay was badly banged up on 18/6 while working for Ronin Pro Wrestling in Pembroke Pines, FL. LeRay tagged with Joey Ryan against Trevor Read & Mike Monroe and had to be taken to the hospital after the match. Early on 19/6 she tweeted, “4 hours in the ER watching drunk people take precedent to my concussion, possible broken nose and huge hole in my lip. Left. 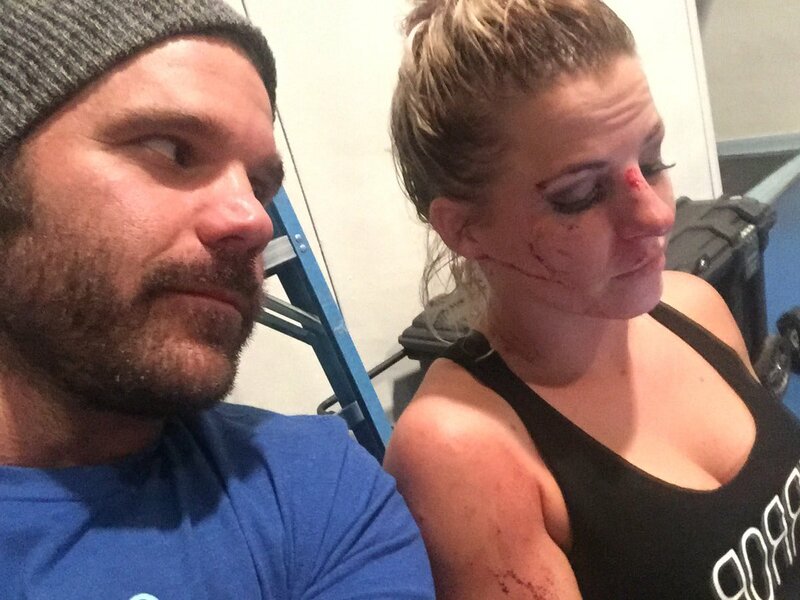 No diagnosis.” LeRay followed up with a Tweet on 20/6 and noted she had gone to another hospital in Cleveland, where she lives with Johnny Gargano. 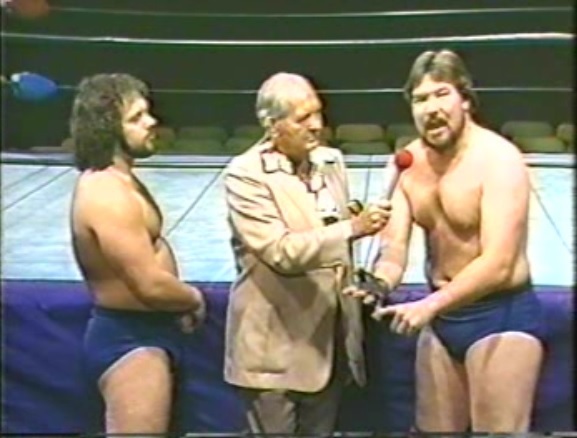 “Landed in CLE – @Johnny Gargano took me to a real ER here. Only there 1.5 hours for testing & results. Nose is broken. Dental work to come.” On 22/6 she added that her doctors had ordered her to rest for about two weeks. LeRay missed a booking for Atlanta Wrestling Entertainment on 19/6 due to her injuries and was replaced by Kiera Hogan. Rev Pro announced on 26/6 that Vader vs. Will Ospreay is in fact going to take place on August 12 at York Hall in London. Vader was critical of the Ricochet/Ospreay match from the BOSJ on 29/5, which led to Ospreay doing Vaderbombs in subsequent outings and even making “It’s Ospreay Time” T-shirts. 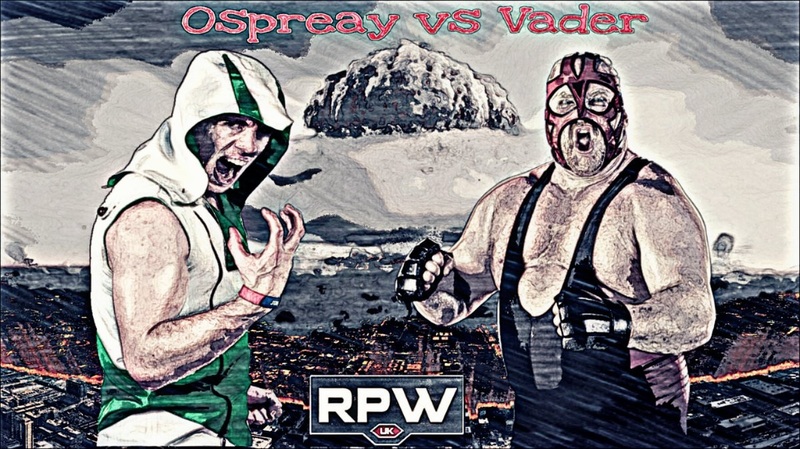 Promoter Andy Quildan tweeted on 26/6 that he couldn’t help himself in booking the match, after Ospreay noted that he would love to face the 61 year-old Vader in the ring. What a time. RAW on 20/6 did a 2.44 rating with 3,467,000 viewers for the show after Money in the Bank and Dean Ambrose’s first night as WWE Champion. 8pm did 3,420,000. 9pm did 3,562,000 & 10pm did 3,420,000. That’s way up from the record low 2.03 and 2,962,000 they did last week. IMPACT on 21/6 did 304,000 viewers, up from the 210,000 who stuck around during last week’s disaster to catch the 10:50pm airing. With replays however, the number is down slightly from a combined 327,000 last week. 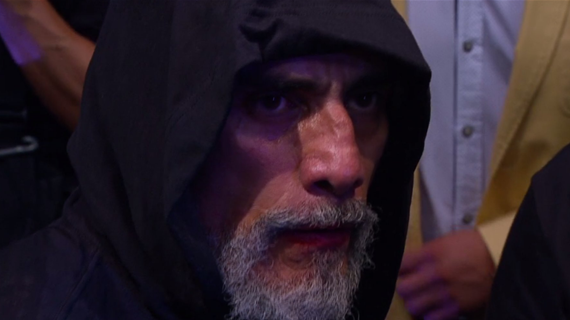 Lucha Underground on 22/6 did a combined 166,000 viewers; 104,000 for the first airing and 62,000 for the replay. That’s the largest number since May 25th and up from the 128,000 last week. SmackDown on 23/6 did a 1.58 rating with 2,145,000, up slightly from the 1.56 and 2,073,000 last week. * Gran Metalik (Mascara Dorada) beat Alejandro Saez with the Dorada Screwdriver. * Ho Ho Lun over Ariya Daivar with a German Suplex. * Cedric Alexander beat Clement Petiot with the Lumbar Check. * Brian Kendrick submitted Raul Mendoza. * Tajiri over Damian Slater with his Execution head kick. * TJ Perkins tapped Da Mack with the Ankle Lock. * Lince Dorado downed Mustafa Ali in a reportedly excellent match. * Akira Tozawa beat Kenneth Johnson with a Delayed German Suplex. * Zack Sabre Jr submitted Tyson Dux. * Drew Gulak tapped Harv Sihra with the Dragon Sleeper. * Tony Nese downed Anthony Bennett with the 450 Splash. * Kota Ibushi pinned Sean Maluta with the Last Ride Sit-Out Powerbomb. * Rich Swann over Jason Lee with a standing 450. * Noam Darr submitted Gurv Sihra with the Champagne Super Kneebar. * Jack Gallagher beat Fabian Aichner with a corner Dropkick. * Johnny Gargano pinned Tommaso Ciampa with a Crucifix pin in match that was said to be excellent. In addition to the CWC tapings, WWE taped three episodes of NXT at Full Sail this week and there were some notable losses for two big acts, who surely are on their way up to the main roster. Shinsuke Nakamura beat Finn Balor in a reportedly tremendous match and by all accounts it felt like Balor’s farewell in the building. American Alpha also lost a rematch to the Revival and put over the Authors of Pain on their way out. Bayley pinned Alexa Bliss. Nia Jax confronted Bayley afterwards. The Hypre Bros vs. Blake & Murphy was interrupted by Rhyno, who Gored everyone to death. The Revival retained the NXT Tag Team titles over American Alpha in a 2 out of 3 falls match. Samoa Joe came out for a promo and was interrupted by Rhyno. Austin Aries squashed Patrick Clark. Andrade “Cien” Almas over Angelo Dawkins. Asuka submitted Eva Marie with the Asuka Lock. (The Finn Balor/Shinsuke Nakamura match will be edited in to this episode).